“For ever” — even at the university’s birth with centuries of uncertainty ahead, its founders put no limits on William & Mary’s future. 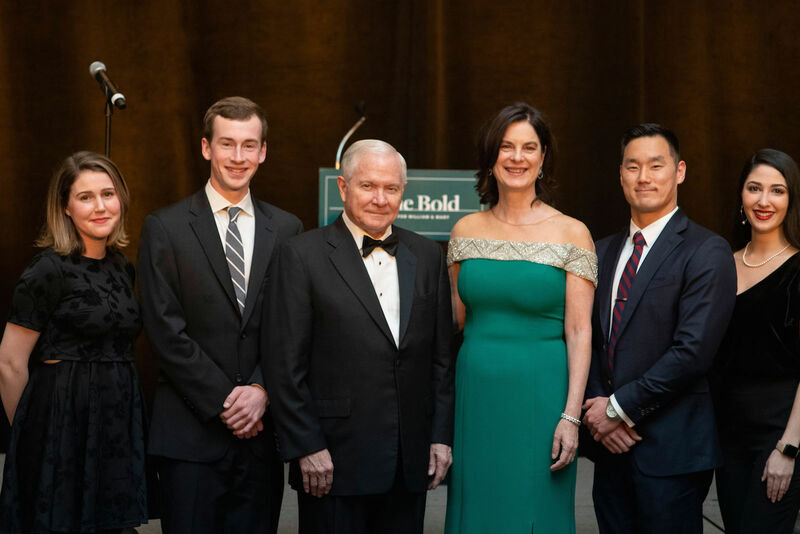 Fast forward to 2019, where in a packed room at the Charter Day dinner the audience, including President Katherine Rowe and Chancellor Robert Gates ’65, L.H.D. ’98, watched from their tables and looked into the future of service, knowledge and work, 326 years in the making. One by one, three students and one alumna shared their stories, all connected by the university and with opportunities made possible by philanthropy. Rachel Coughlin ’19, Henry Crossman ’19, Aili Espigh ’17 and Dennis Kim M.B.A. ’19 — two seniors, one graduate and one graduate student — are paying it forward, with their work, their research and their bravery. They’re moving from William & Mary into the world — leaving a legacy of green and gold. Coughlin, Crossman, Espigh and Kim are working, all with the charter in the back of their minds. 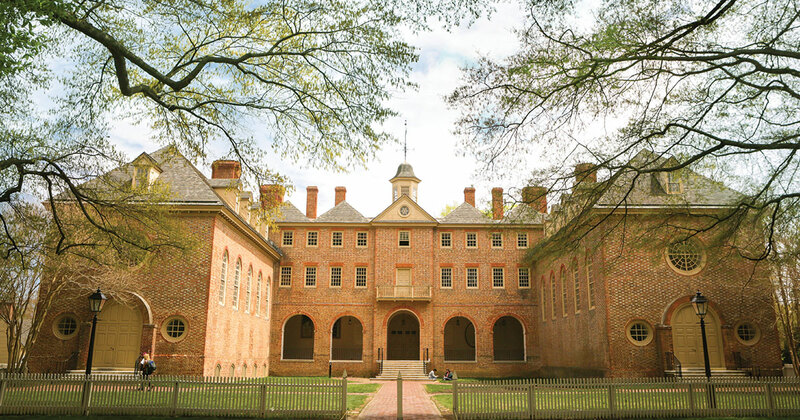 They’re carrying 326 years into 327, 328, 329... They’re four individuals out of hundreds of thousands making sure the name of William & Mary continues — forever. And even in 2019, they’re just getting started. Rachel Coughlin ’19 is one of the 22 percent of women who earn degrees in computer science nationally, a number almost stagnant for the last 10 years. Last year, close to one-third of computer science majors at William & Mary were women, but, as Coughlin said, the goal is still 50-50. That disparity is why her trip last year to the Grace Hopper Celebration of Women in Technology was so important. Part job fair, part lecture series, Grace Hopper connects 700 employers with 13,000 women in business over three days. According to its website, the event is the largest gathering of women technologists in the world. The university computer science department provided funds from the For the Bold campaign for Coughlin and other students to attend the conference. They prepared rigorously, and the results spoke for themselves. Coughlin herself left with multiple offers and eventually accepted a job with Nordstrom’s systems engineering team in Seattle. “It’s hard to follow that,” Henry Crossman ’19 joked, walking to the stage after Coughlin. But Crossman followed well, describing his research out loud in professional punctuated sentences like the words on a white paper. An international relations major, after arriving at William & Mary Crossman soon found himself doing research with his professors, and that research soon took him halfway across the world. On-the-ground work with a professor in Tanzania helped him explore the links between mobile phone usage and women’s economic livelihood. Made possible through private funds, that research was the first large-scale field experiment of its kind and helped create a partnership with the Tanzanian government to effect real-world change. Motivated by that experience, Crossman later formed a student team to compete in the Global Research Institute’s Shark Tank competition and won several thousand dollars to explore whether insurance provided through mobile phones can help Kenyan Farmers’ resilience to economic shocks. As an undergraduate student, Aili Espigh ’17 got involved with the Global Research Institute because it was a research opportunity that paid. In fact, part of the reason she attended an interest meeting for the institute’s first-ever Shark Tank was, well, the free pizza. Those perks might have drawn her in, but it was the excitement of constant knowledge-creation that kept her there for three years. A proud member of the Society of 1918, Espigh began her own research, studying how humanitarian-aid donors responded to crisis situations around the world. If people could track where aid is allocated day-to-day, she reasoned, then they could figure out how best to invest their resources. That research helped her discover that funds had been wildly misreported during the 2014 Ebola crisis. With the encouragement of a professor in the international relations department, Espigh and her research partner travelled to the Massachusetts Institute of Technology to compete in a research competition. Up against a field of 38 other teams, including masters and doctoral students from 11 countries, Espigh and her partner placed third. “We proved once and for all that William & Mary undergraduates can hold their own against the best of them,” Espigh said, her hoop earrings shaking with excitement. Without even a master’s degree, Espigh is leading a redesign of estate operations for all of a large financial corporation. And the Global Research Institute’s AidData team, by the way, still uses the research methodology she developed as a student. William & Mary’s legacy of military service spans three centuries, and Kim too follows in that tradition. His father operated a tank in the South Korean Army during the Korean War, and his grandfather was an infantryman. During the war, Kim’s grandfather befriended an American soldier, and while brief, their friendship was extremely important. Despite the language barrier, they provided each other comfort and helped each other survive. Kim, born almost 30 years later, is named after that soldier. There is a plaque in the Wren Building listing names of fallen service members from William & Mary. In front of a silent room, Kim began reading names one by one, pausing in between. While he only mentioned a few, there remain hundreds on the plaque, with some not yet memorialized. As he stepped away from the podium, the room erupted in a standing ovation. Kim thanked them for investing in America’s future, the audience thanked him for investing in theirs.